LAWRENCE, T.E. (1888-1935). 'Lawrence of Arabia'. Typewritten Letter Signed ('T E Shaw A/c 338171'), 1 page 4to (small nibble from upper right hand corner, and light soiling), Hythe, Hampshire, 5 October 1933. Without salutation, sending nine sets of engine test sheets (no longer included), and certifying that he had personally witnessed the tests. 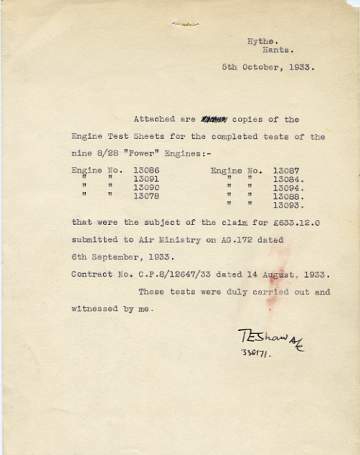 'Attached are copies of the Engine Test Sheets for the completed tests of the nine 8/28 "Power" Engines [engine number listed] that were the subject of the claim for £633.12.0 submitted to Air Ministry on AG.172 dated 6th September, 1933. Contract No. C.P.8/12647/33 dated 14 August 1933. Lawrence enlisted in the Royal Air Force in 1922, under the name of John Hume Ross. He changed his name again to T.E. Shaw in the following year. Although he briefly left the RAF for the Tank Corps when his identity became known he soon returned. The name of Shaw was legalised by deed poll in 1927. Lawrence spent the last six years of his service testing, supervising and even designing powerful motor-craft at Plymouth. This is the archived description of an item that has already been sold. You may search or browse current stock from the links above.